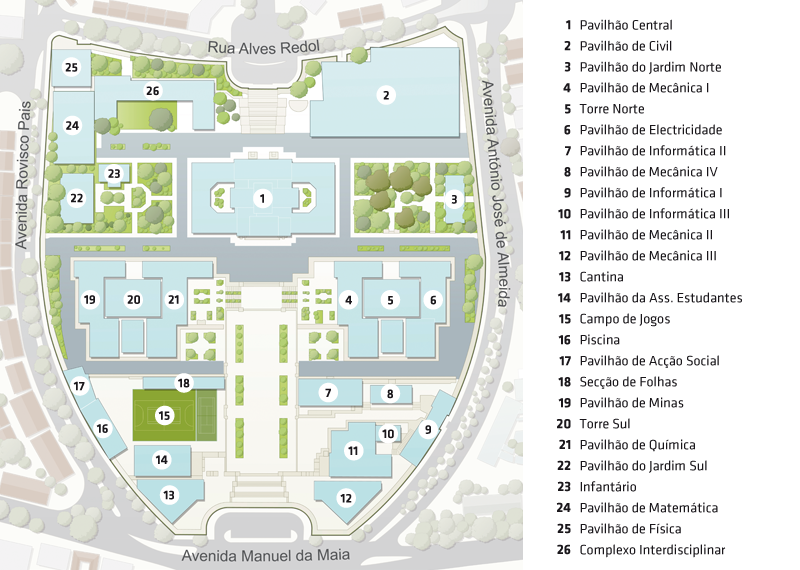 CeFEMA’s members and most laboratories are located in the Physics (25 in the map) and Chemical Engineering (20 in the map) buildings of Instituto Superior Técnico, Alameda campus. The campus can be accessed by Av. Rovisco Pais, Av. António José de Almeida (side entrances), Av. Manuel da Maia (front entrance) or Rua Alves Redol (back entrance). More information about Lisbon Bus lines visit the Carris website. Car parking at the IST Alameda Campus is severely restricted and you are advised not to bring a car unless prior arrangements have been made. Two nearby public car parks are located at Rua Alves Redol (within 50 m from IST, back entrance gate) and Alameda (near Alameda Metro Station). Charges are applicable. IST Alameda Campus is easily accessible by Metro from Lisbon Airport. Take the Red Line to Saldanha/Arco Cego or Alameda stations. Take the Red Line to Saldanha or Alameda stations.